As arty folks everywhere know all too well: craft supplies multiply faster than rabbits. In my own life, it ebbs and flows. Every time I organize things and feel like I’m on top of it, a couple of months later I’ll look around and see several piles of miscellaneous new materials lurking! 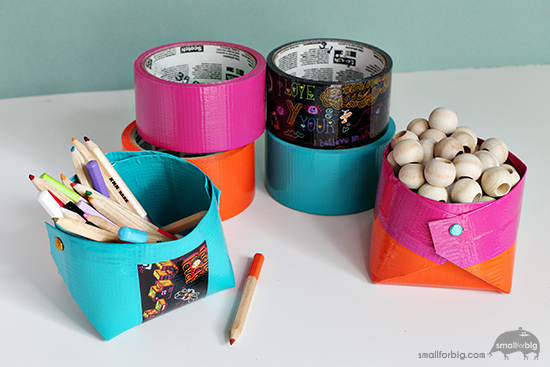 Why not use some of those supplies to make better storage options? 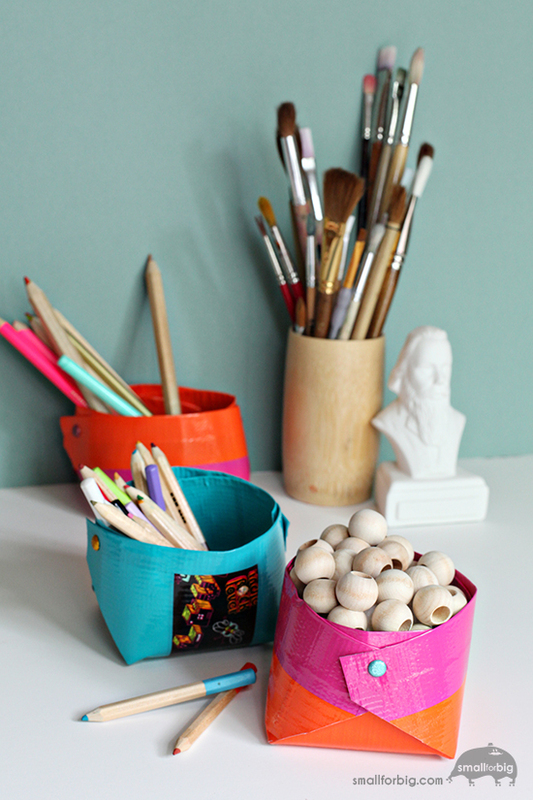 Better and prettier storage options, naturally. It turns out it’s easy to do, and several of these Scotch® Duct Tape boxes are now lined up on my desk. Unfortunately, they’re no longer holding my craft supplies, but instead categorizing Birdie’s rock collection. Turns out these boxes are awesome at doing that too. But hey, that gives me an excuse to make some more! 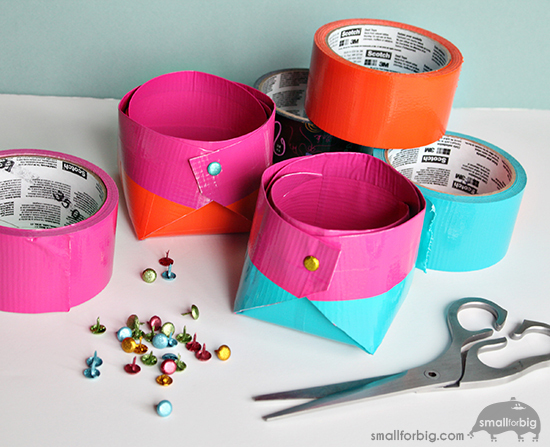 Scotch® Duct Tape – for these boxes I used Hot Pink, Blue Turquoise, Tangerine Orange, and Word Up. Download this quick template and print. Cut the excess paper off of the bottom, leaving you with a square. 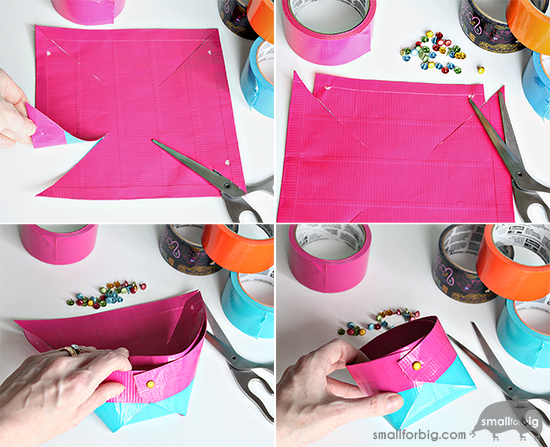 Cover the backside (un-printed) with Scotch® Duct Tape – this color (hot pink) will become the inside of your box. Trim the edges of the duct tape off with your scissors. Cut from the corners towards the center of the square, following the lines on your template. Cover the printed side of the paper template with your second color, but you don’t need to go to the edges. This color (Blue Turquoise) become the outside of your box. 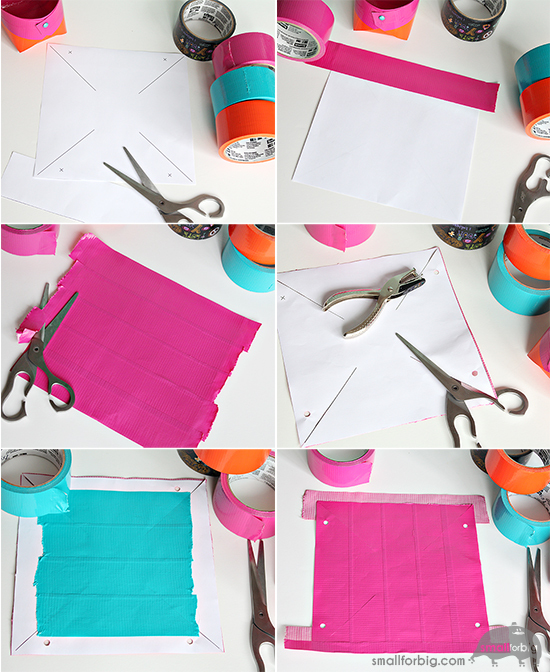 Switching back to the first Scotch® Duct Tape color (inside – hot pink), cover the edges of the exposed paper, and fold about ½” over the edge of the paper to the other side. Cover 2 opposite edges first, trim the excess. Then cover the remaining opposite edges and trim. Now, re-cut the diagonal cuts from the corners towards the center of the square, using your first cuts as guides. Re-poke or re-punch the 4 holes as well. Find the points with holes punched, and trim them (see photos above) – this is optional, but it makes them stick out less. Take the points without holes and fold them towards the center. Grab 2 opposing holes and overlap them, secure with a brad. Repeat on the other side. You may need to pull and adjust the box a little bit to even things out, and to help it sit flat. Now fill it with your favorite things! I am proud to be a 3M- sponsored blogger, and, as part of my responsibilities, I get the opportunity to evaluate new products from Scotch® Duct Tape. Opinions are my own and additional product used in the project were selected by me. Yay! Thanks Zakkiya! And once you’ve made a couple you’ll see how easy they are and you can make any size you want without a template! What a great idea! Scotch tape in all its power. Thanks Kristin, I’m starting to believe duct tape can turn into anything. Wow, this was so much fun to make! Thanks for the pattern. I’ve made a smaller one, and a larger one using some of the patterned tapes and they are so cute. I didn’t use brads, instead punched another hole into the middle of the inside wall and used string and twine to hold them together. It’s a neat look. And using the string to make a handle for the box, I’m thinking these would be great gift ‘bags’ for parties and other get-togethers. So many possibilities :) Thanks again! Wow, those are such great ideas Katy! Thanks for sharing them, and I’m so glad you enjoy making them too! Next post: our new favorite crayons, markers, pens, pencils, etc.